Sunnin' In the City: Woman of Steel! When I was younger, I always wanted to be wonder woman. I mean who wouldn't right? She was beautiful, intelligent, had really cool bracelets and a tiara that protected her and she spun around in circles. Everything a little girl could ask for. The above picture is actually a picture of an xray that I took with my camera phone. I was being sneaky. The doctor had not come in yet, and they put up my xrays on the computer so I really quick snapped this shot. 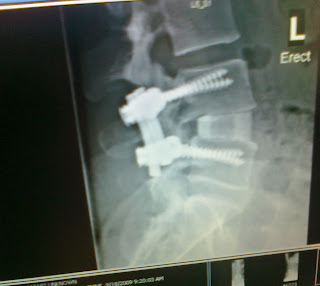 You can see the bone that they put in my back (where a space normally would be there is the bone); and the screws securing it and holding me together. They are actually MUCH bigger than I thought they were going to be. It almost looks like the top one was going to come out of the top of the disc. It's actually quite interesting. Let's just hope it works!!! That is CRAZY! So glad you are doing well. That is totally amazing!!!! Hope everything works out wonderwoman. OMG, this looks bad. Miss you! Can't wait to hear you on the calls when you return..